When I was in school, I took the foreign language recommended for students with an interest in science: Latin. In hindsight, I wish I had taken German. 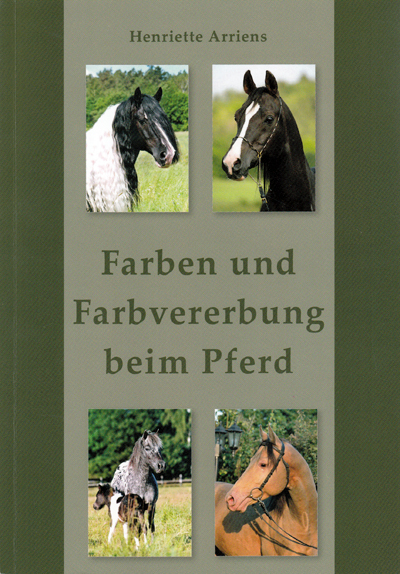 That’s because some of the most comprehensive books on horse color published in the last few years have been in German. They might not be especially useful to American readers, but we have a surprising number of foreign subscribers that might find them useful. 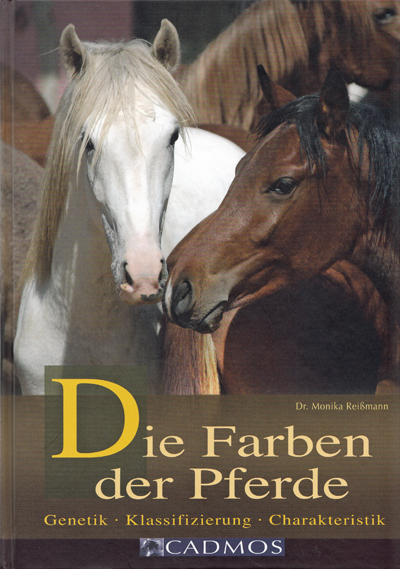 I just received this book a week ago, on a recommendation from Thomas Armbruster, author of a three-volume set of books on the Black Forest Horse. I had high hopes for it, since it was by one of the authors of “Coat Colors at the Beginning of Horse Domestication” – easily one of the most fascinating papers on horse color to come out in recent years. Although I have just begun to translate the book, already I can say I am not disappointed. 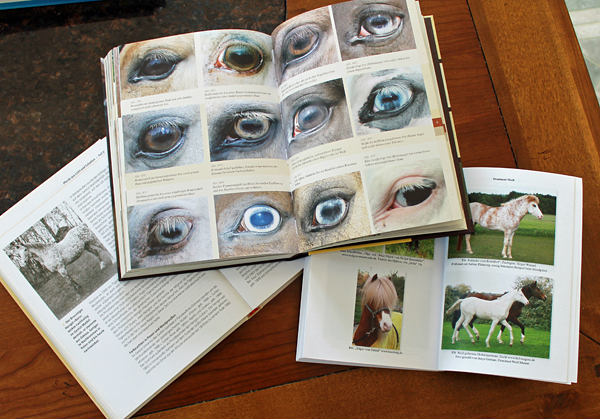 The book covers not only the latest on recently discovered colors, but also many of the quirky aspects of horse coloring that have not been the focus of formal studies. The whole book is lavishly illustrated in full color, and is particularly rich in detail shots. I had been anxiously awaiting this book since I first heard that Henriette was working on it. There are few researchers I whose observations and conclusions I would trust more thoroughly. It is in many ways a more technical book than the previous one, but still written in a more accessible style. It is primarily a black-and-white book with lovely illustrations and diagrams. (When it arrived I was thrilled to see that I wasn’t the only one who thought a lot of information about color could still be conveyed without color.) It does have color plates in the back, though, and they are all stunning photos by Irene Hohe. There is also a second version that primarily concerns the Icelandic. This is an older book, and I believe it is no longer in print, but I had no trouble finding (quite reasonable!) copies. 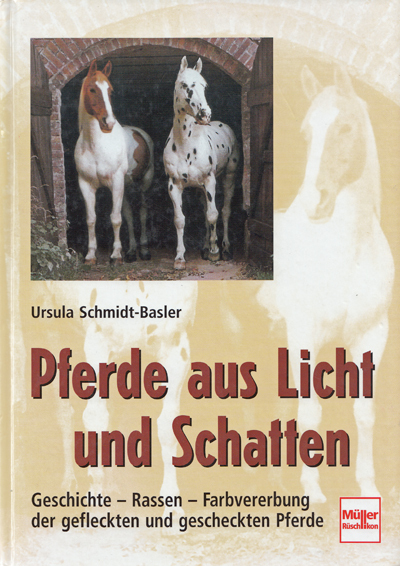 It is not a book about color so much as it is a book about colored horses, most specifically pinto and appaloosa horses in Europe. It is full of fascinating information on the history of some of the colored lines in European warmbloods, particularly those that came from Dr. Lehmann’s Mathildenhoh Stud. There are wonderful rare photos his tobiano Lipizzan and his warmblood Bars, who went on to give the appaloosa coloring to the Polish warmblood breeds. There are color photos, but many of the historical photos are black and white. And finally, a gadget! I don’t recommend those often because unlike the rest of my family I simply lack the “gadget gene”. This one, however, is worthwhile. This is the (somewhat foolish-sounding) Magic Wand scanner. I originally purchased it to take with me to the National Sporting Library. I wasn’t sure if I could set up my laptop and scanner, and the wand works as a stand-alone product. It uses ordinary AA batteries and stores scans on a micro SD card. It was really useful for that purpose. Not only is it a lot easier to carry around, but in most cases it can scan a lot faster than a flatbed scanner. But it has gotten a lot more work as a translating tool. 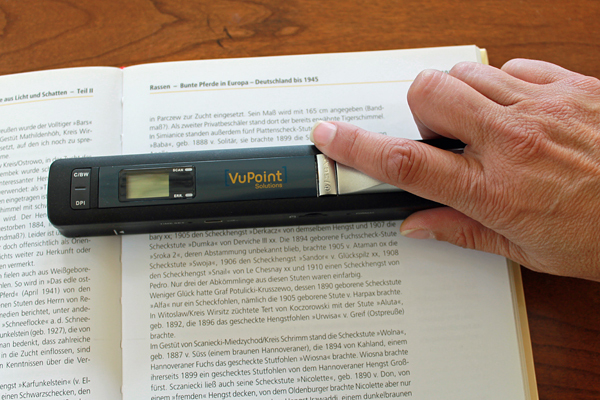 It can scan pages of text which are then read by OCR software and fed into Google Translate. It isn’t perfect and it takes a bit of time, but it does make books like these accessible. This is Jag, my appaloosa puzzler. I mentioned Jag and what makes him unusual in one of the earliest posts on this blog. That’s because there are aspects of Jag’s pattern that say he is heterozygous for the varnish roan gene. His blanket is most definitely spotted. And yet his feet, which have no white markings whatsoever, are predominantly shell-colored. They were recently trimmed in this shot, which is why they are so bright. Here they are a few weeks later. The dark area on the left hind (furthest right in the picture), is not visible in the shot above, since he’s facing the other direction. That one area is a bit darker and more striped, but otherwise the hooves look more like the shell hooves of a homozygous horse. 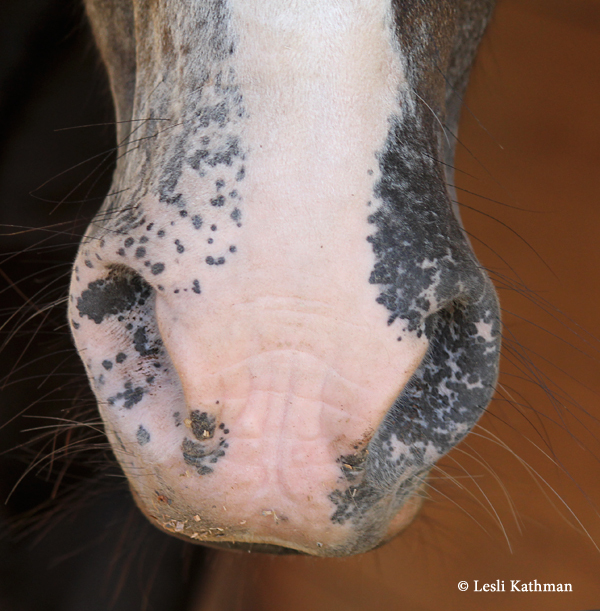 He also has mottling on his muzzle that I think of as being more typical of homozygous horses – but only one one side! See how pink and freckled with black the one side is, while the other has the webbing of pink on a dark background? In fact, that area that looks so pink is even roaning out really fast, while the rest of his face – indeed, almost his whole body – shows almost no varnish roaning. 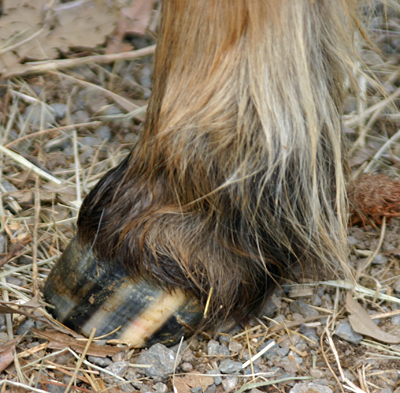 The patch of varnish roan can be seen in the picture with his newly trimmed hooves. Here if a face shot that shows his roan patch pretty well. The only other area he is showing any significant roaning is his tail, which – like the patch on his face – is silvering quite rapidly. Jag also has mottling around his eyes, though it is not very pronounced. He has a partial blue eye on the right side, too. Jag is a puzzle to me. I am looking forward to the release of the leopard complex test, because I’d love to test him to see if he is truly heterozygous (as his spots suggest). I had a few more detail shots of Colt, my friend Marge’s elderly fewspot gelding who was used in yesterday’s post. As I mentioned in an earlier post about mottling, homozygous appaloosas like Colt often have more pronounced face mottling. Here are some pictures of his muzzle. 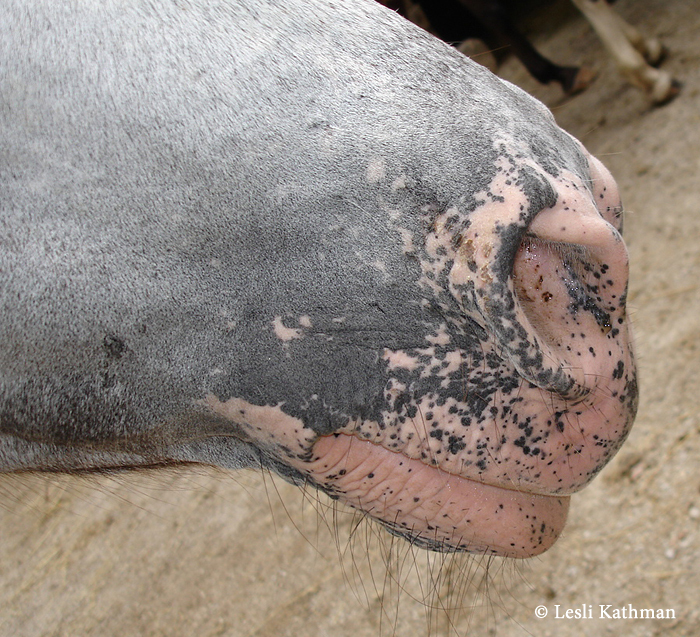 In my experience, homozygous appaloosas seem more likely to have this kind of mottling, where it looks like areas of pink skin with an overlay of small, dark spots. He has less pronounced mottling around his eyes, but he does have it. Here is another body shot of him. Notice how light his front hooves are, even though those legs are solid (and black-pigmented). Also note how very white his hindquarters are. That is one way to know he is not a false snowcap, because the real ones often have underlying pink skin that give them that really, really white look. 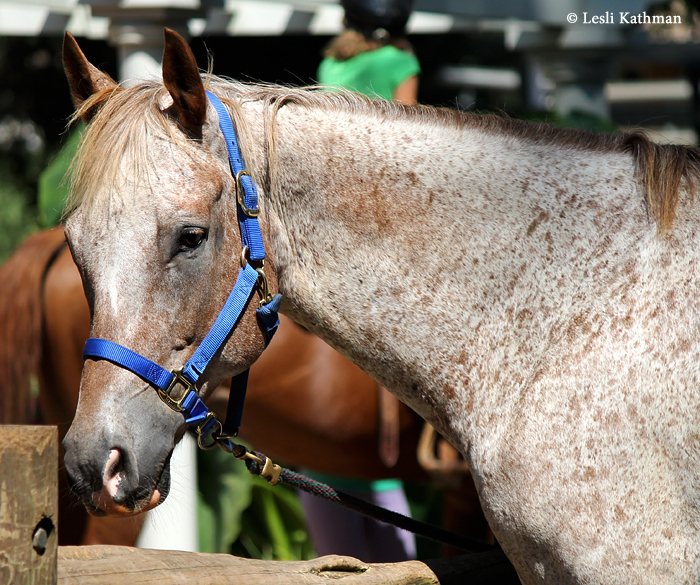 Before I do that, though, I have a puzzler of an appaloosa that I will post tomorrow. 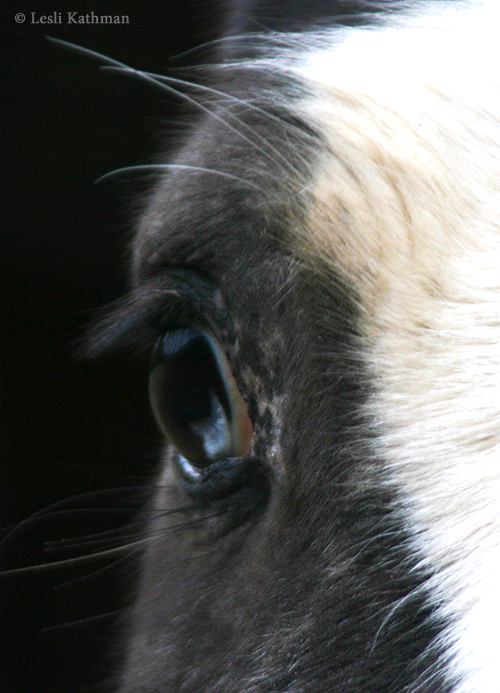 responsible hoof striping, white sclera and mottled skin. When that master switch is paired with additional patterning genes, varnish roan is changed to the louder blanket and leopard patterns. palomino, while if that same horse inherited two he would be a cremello. Leopard complex works much the same way; horses that inherit two copies of the gene will look different from horses with one. There are other differences, too. Probably the most important of these to an artist is that while the hooves on the dark legs of a heterozygous appaloosa are striped, the hooves on the unmarked legs of a homozygous appaloosa will be predominantly shell colored. Remember the varnish roan from a few days ago? His pale hooves suggest he’s probably homozygous for Leopard Complex. 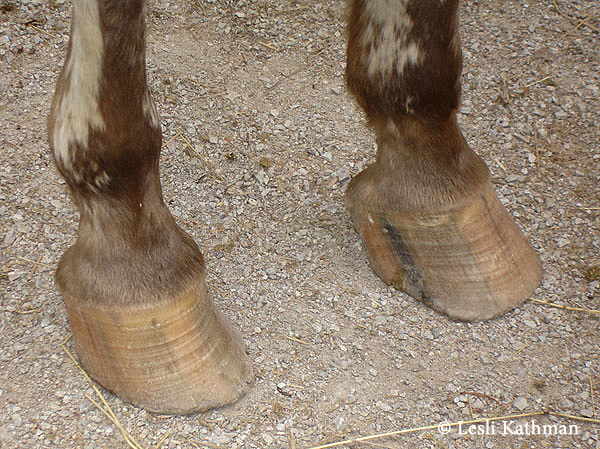 He doesn’t have a pattern gene, so there are no spots to remove, but his hooves are a clue. Here is an elderly fewspot leopard with the same kind of coloring on his hooves. 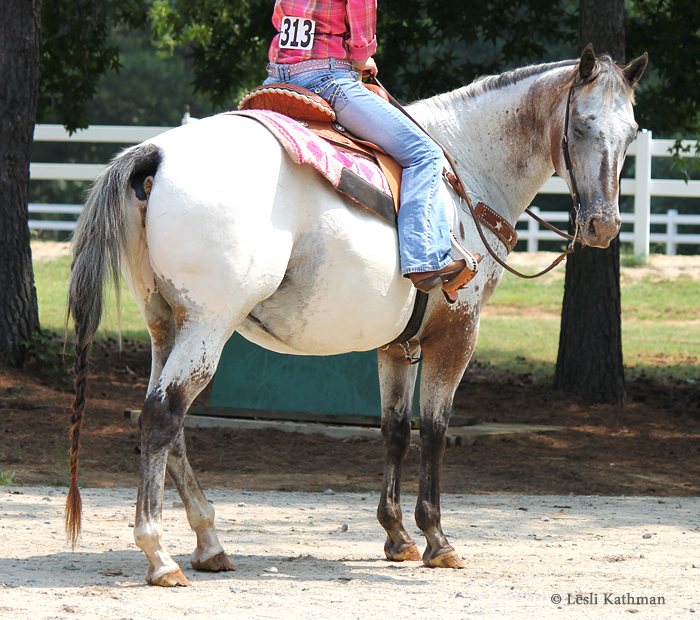 Appaloosa legs with regular white markings like socks and stockings will have ordinary shell hooves no matter whether the horse has one copy or two. 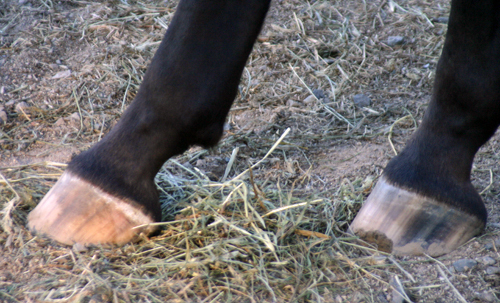 Of course, marked feet on non-appaloosas vary in terms of how uniformly pale they are. But in general the homozygous appaloosa hooves look a little more striped than the typical marked foot, and a lot less striped (and a lot less pigmented) than heterozygous appaloosa hooves. 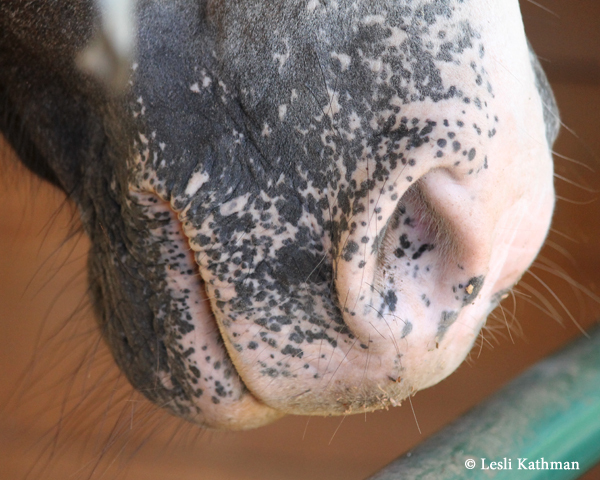 Here is the hoof on a heterozygous (ie., spotted) appaloosa. Note that the legs in both pictures are dark, and in fact are even the same basic color. Both are genetically black horses that have the bronzing effect found in some appaloosas. 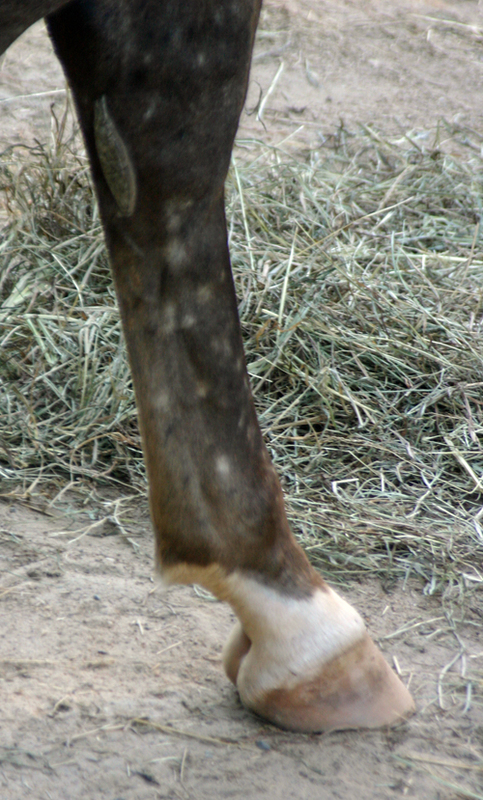 Here is the hoof of the same horse as pictured above, only on a leg with a white marking. When horses have one of the major patterns like leopard or blanket, then the presence or absence of spots makes it pretty easy to tell whether the horse has one or two copies of leopard complex. It’s a bit harder with horses that don’t have an obvious pattern gene. Many varnish roans do not have spots, especially if the varnish pattern is very subdued. 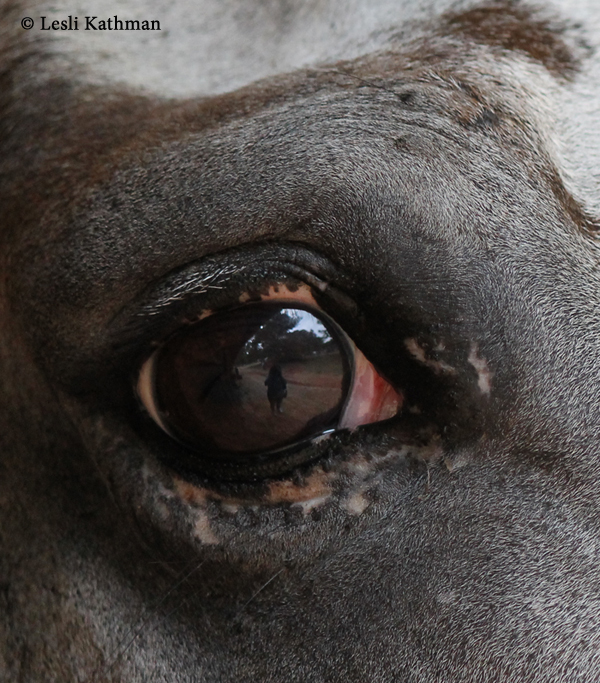 The hooves are often the best clue, though those are often hidden in pictures. 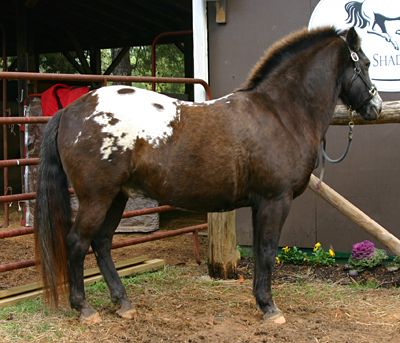 Hoof coloring can also be hard to determine in pasture-kept horses. The hooves in this post are all on pasture horses that haven’t been recently trimmed, so what striping is there is a little more muted. 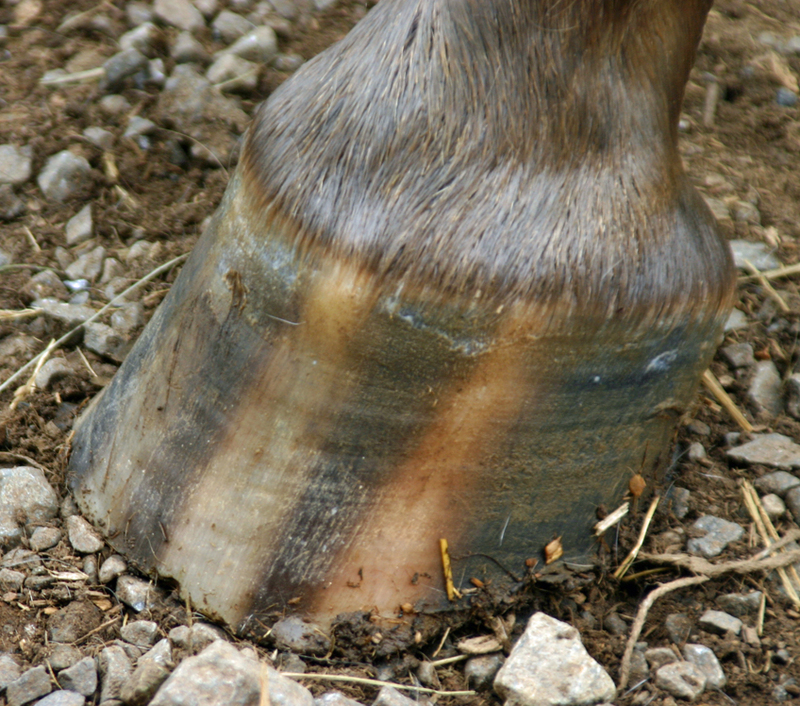 Here is the hoof from the post about the pony Thumper, showing the stripes on a recent trim. A word of caution, though. There are things that can make a horse look like a fewspot or a snowcap, besides the presence of two Leopard Complex genes. 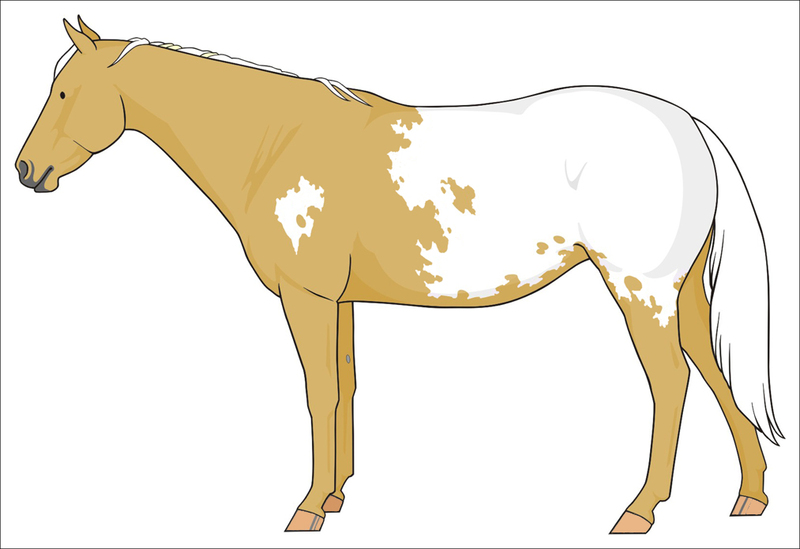 When paired with the appaloosa patterns, sabino tends to whiten the pattern and reduce the size of the spots, which can give horses the appearance of being homozygous. 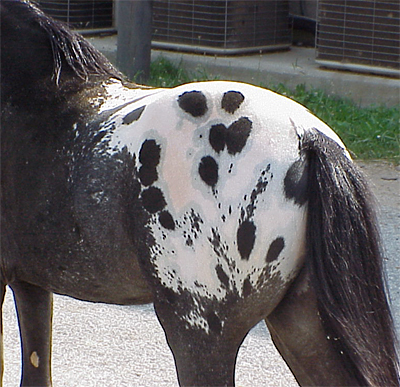 These horses are sometimes called false snowcaps or false fewspots. 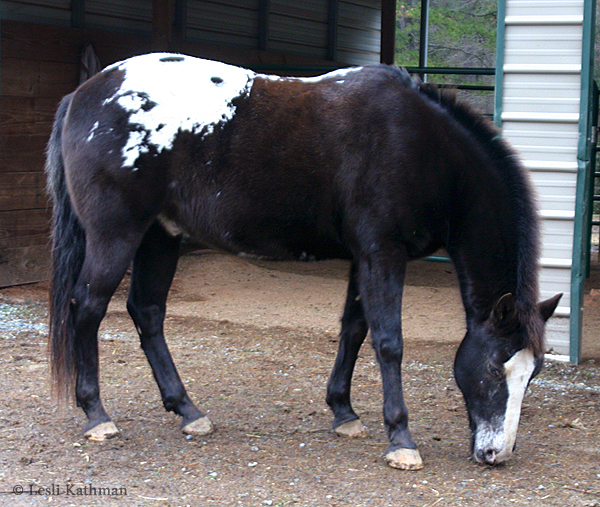 When looking at something that might be a snowcap or fewspot, check for face and leg markings. 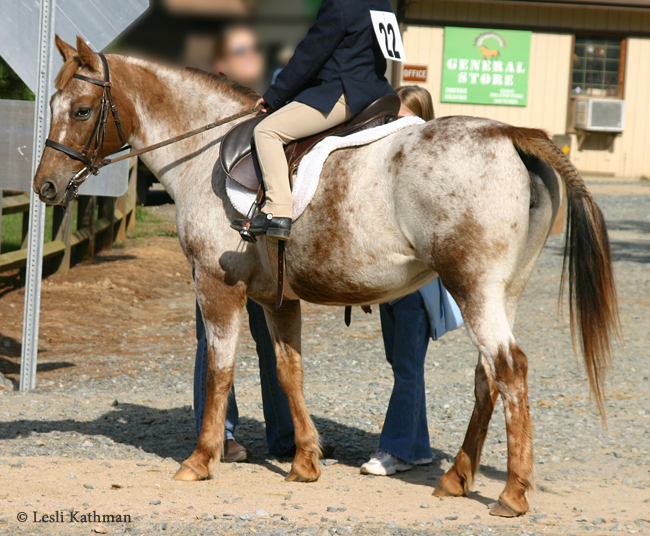 If the horse has flashy markings, his spotless appearance might be due to that rather than having two appaloosa genes. 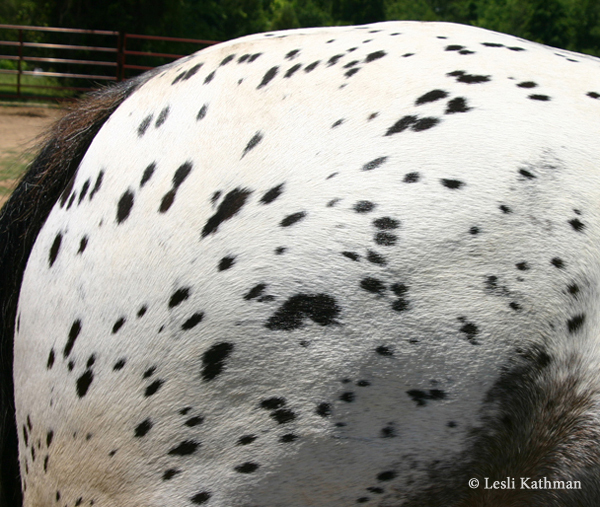 In the last post, I talked about how the varnish roan gene sets the stage for the louder appaloosa patterns, which means that no matter what else an appaloosa may be, they are also a varnish roan. 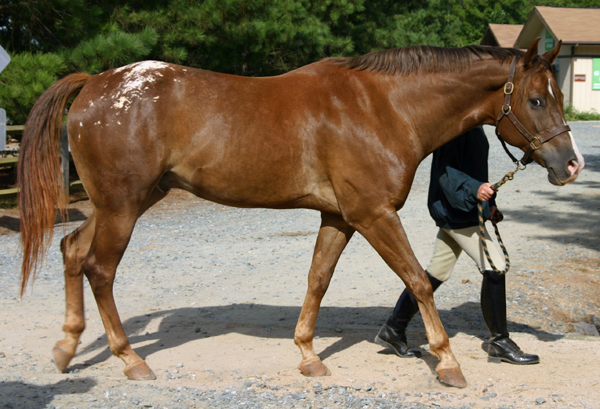 That means that this guy here, while a chestnut blanket appaloosa, is also a varnish roan. complex (varnish roan) modifies the base color, then there are yet another set of genes that then modify the leopard complex gene. These modifiers are collectively called pattern genes, and are given the abbreviation “PATN” followed by a number. The first of these has been labeled PATN1. This is the gene responsible for the actual leopard pattern. 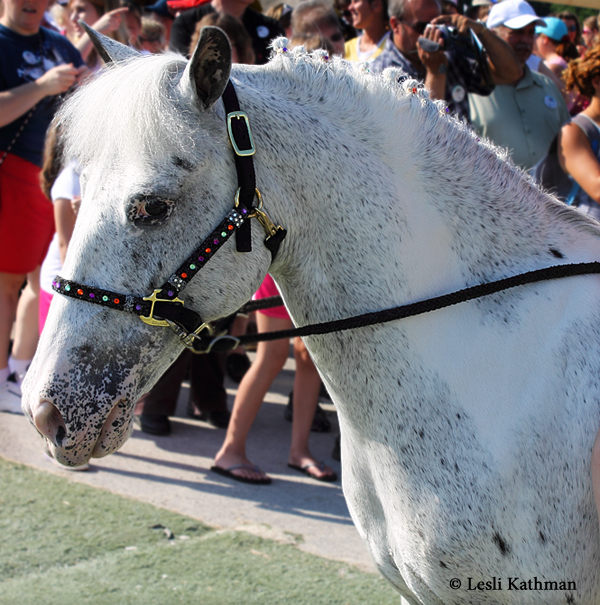 That is, an otherwise white horse that is covered “nose to toes” with distinct dark spots. 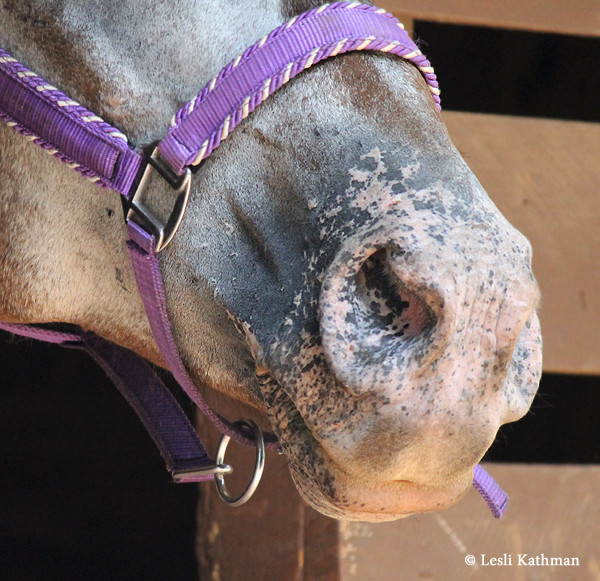 This is the pattern most past studies have focused on, and it has been central in the work done by the Appaloosa Project. It is believed, however, to be just one of the patterns that interact with the leopard complex gene. In fact, what has been most interesting about the current research is just how many genes do interact with leopard complex. Researchers expected to find genes for the leopard and blanket patterns. What many did not expect was that many more genes are involved. The picture is actually much more complex. Not only are there major pattern genes like leopard and blanket, but there are probably other genes that alter the final pattern in more subtle ways. It even looks like some genes that add white patterning (like sabino) can function as pattern genes for leopard complex. 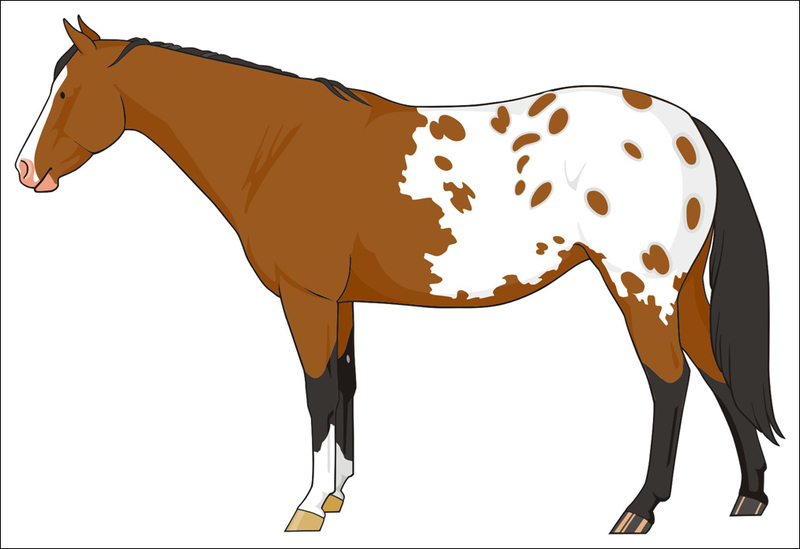 As Christine mentioned in the comments section of the last post, there is a lot of variation in the appaloosa patterns. All those different modifiers working together is part of the reason that is so. The important thing to remember, though, is that appaloosas are all varnishes. Without a pattern, leopard complex is varnish roan. 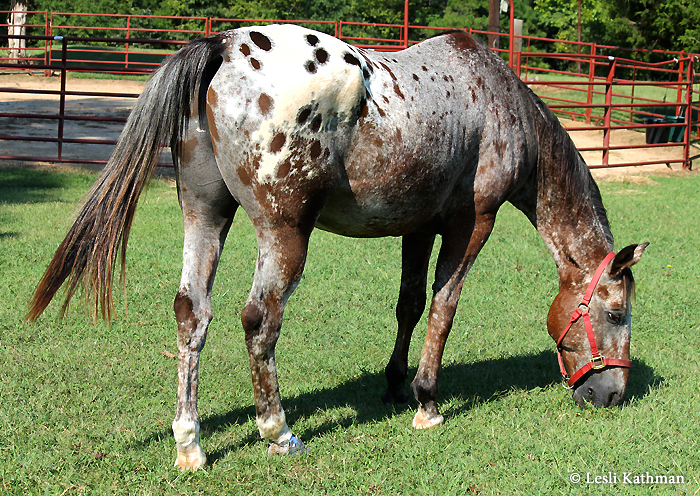 If the horse also inherits a pattern – say, Pattern 2 (PATN2) – he will be a blanket appaloosa. Genetically he’s still a varnish roan, but the pattern gene he inherited transformed the varnish pattern into a blanket. And because he is really a varnish, he’ll have the traits that go with that. 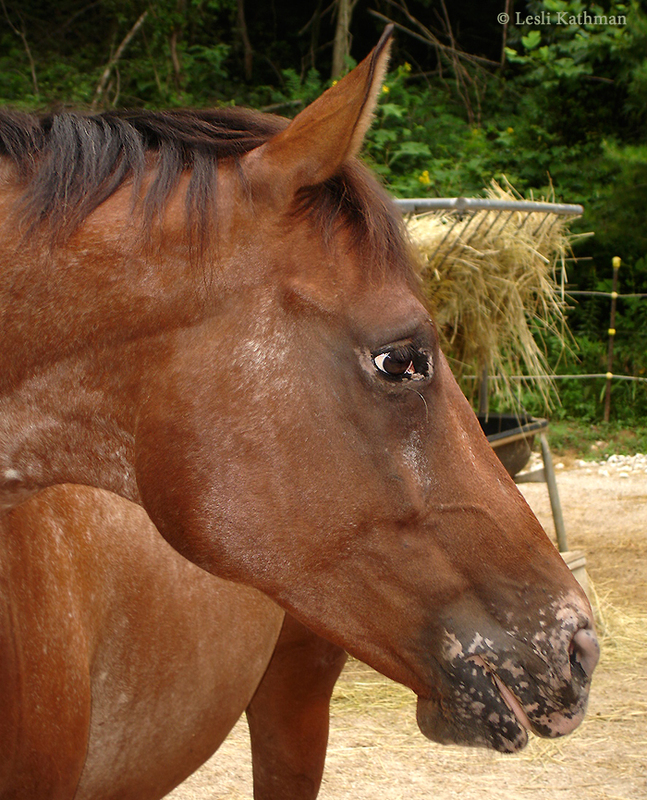 Just as a bay horse that has begun to turn grey can still show signs of his base coloring, so patterned appaloosas still show signs of their base pattern. They have the striped hooves, visible sclera and the mottled skin. The degree might vary, but they will be there. And where his pattern that leaves large areas of body color, those will eventually lighten just like the body of a unpatterned varnish roan. 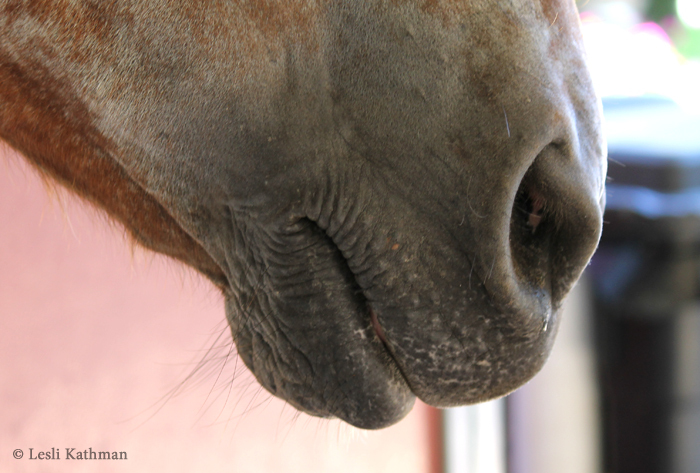 In a close-up of Comanche, the horse pictured above, the original blanket pattern is still quite visible even though the formerly bay areas of his body have roaned out with age. This does vary, just as the rate of roaning varies on regular varnish roans. Blanket patterns like the one at the top of this post can be accurately thought of as a temporary phase in the pattern. 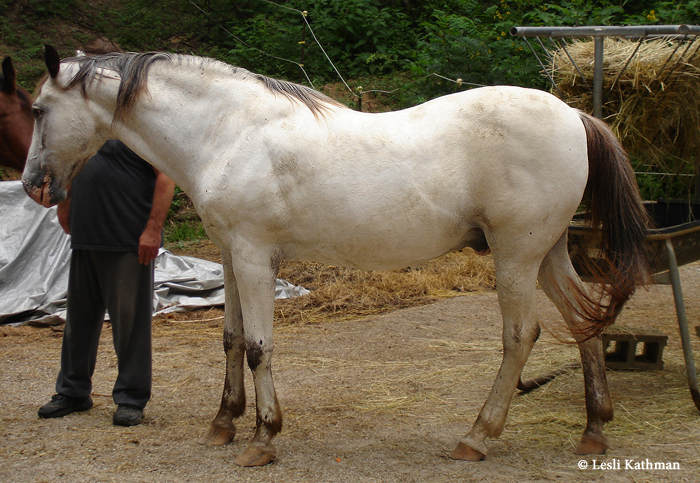 Most will fade with age, leaving the horse looking like a varnish roan with a blanket. The varnish pattern does not cause the whole horse to fade, though. 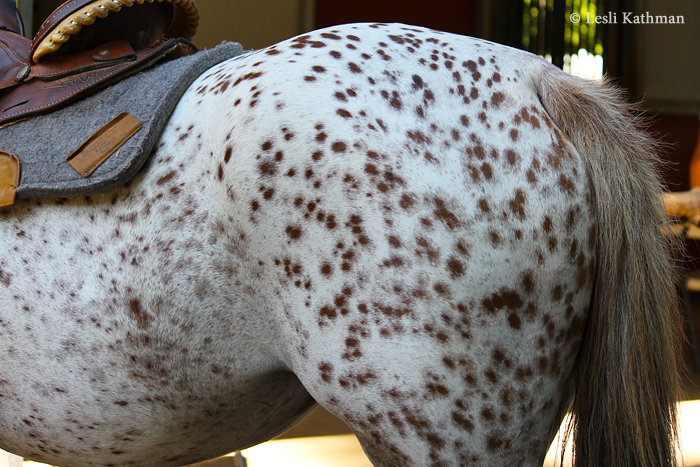 The spots on a pattern do not roan out. 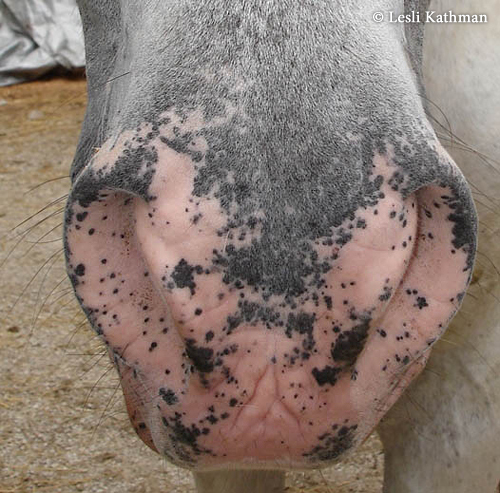 That is actually the easiest way to determine that grey is present in appaloosas; if the actual spots are fading, then the horse is probably has the grey gene. That is one of the reasons that true nose-to-toes leopards have always been so popular with breeders. 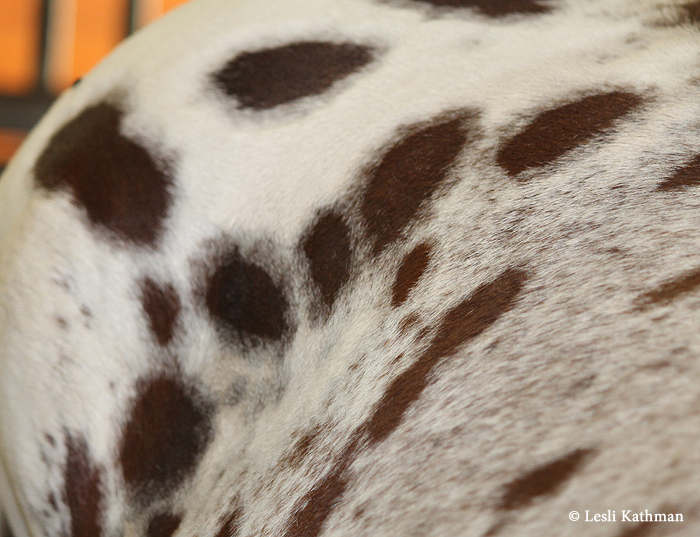 Because their pattern is made up almost completely of spots, they retain their contrast even as they age. 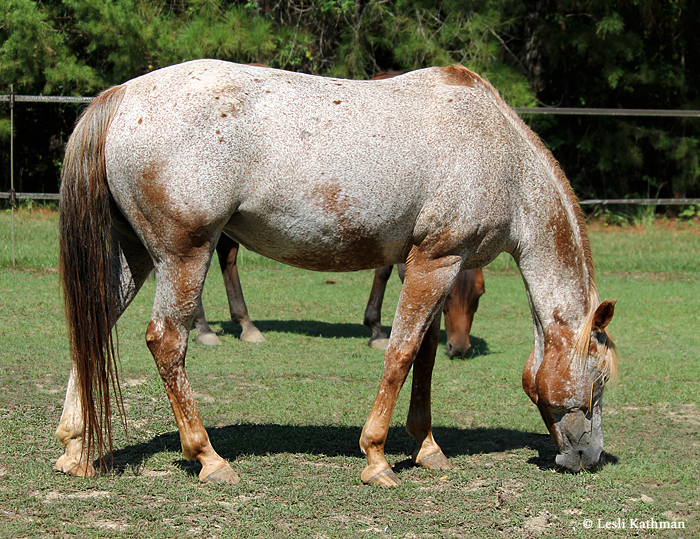 Breeders have selected for horses that keep their color longer because contrast is what makes appaloosa patterns attractive. Roaning, like greying, tends to take that away. It is also true that looking at show pictures is a little misleading because many show horses are young enough that the roaning has either not yet started or has not progressed far. 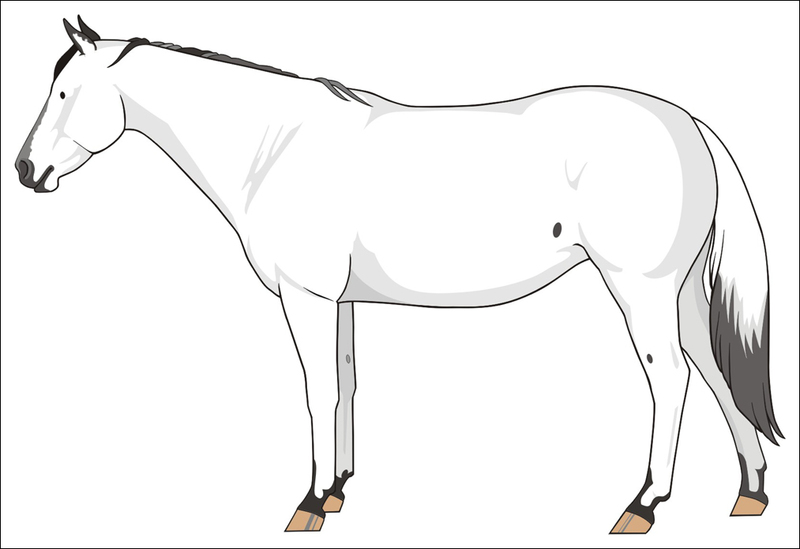 The average group of young halter horses is going to look darker and more contrasted than the average group of aged broodmares, for instance. 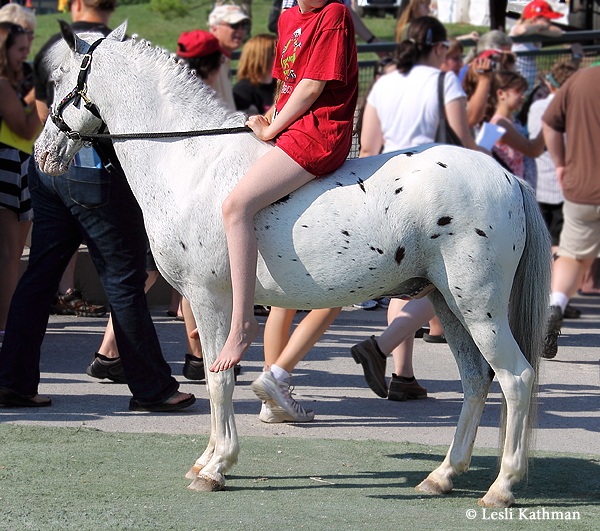 For artists collecting appaloosa references, though, the first group is what we are more likely to encounter. This also means that artists have to keep in mind age when using references, because varnish roan (and any pattern that shows its effects) is another progressive pattern – just like dapple or fleabitten grey. What is realistic for one age group might not be for another. There is another important aspect to the leopard complex gene, aside from the characteristics and the fading. That will be the subject of the next post. 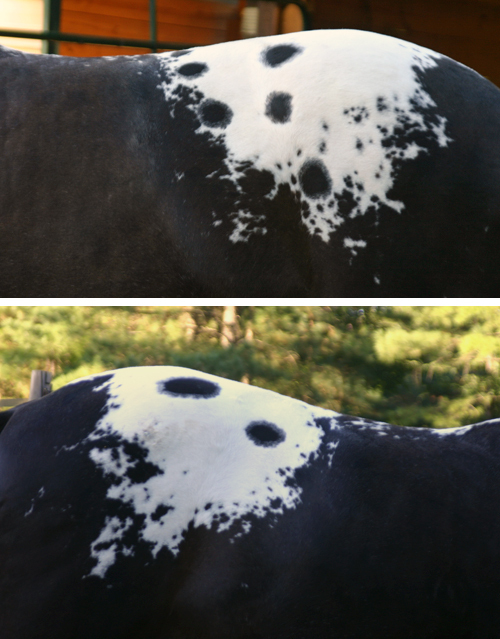 I have some more pictures to post about appaloosa mottling and other characteristics, but before I do that, I thought it might be helpful to post some basic information about how appaloosa patterns work. Some of this information already appeared in The Boat magazine, but I’ll just take the parts necessary to give the basics. This has been a really exciting area of research in recent years, so there is a lot of information, but for now just the most important parts. leopard patterned appaloosas were homozygous. A later study by Dr. Sponenberg, done using Norikers, indicated that leopards were heterozygous while fewspots were homozygous. Varnish roan, which was not thought to exist in the Noriker, was not part of that study. It was assumed to be a separate pattern from the one responsible for leopard. Yet another study suggested it was possible to get almost any appaloosa pattern from any other appaloosa pattern. Needless to say, the information that was available made for a confusing mess. For those that attended my color seminars and wondered why the appaloosa patterns were glossed over, this was why! None of the theories seemed to fit the actual situation, at least not well enough to inspire real confidence. How could a blanket horse produce a leopard, or a varnish horse produce a blanket? It seemed to me that researchers were missing something – something that could reconcile some (seemingly) contradictory theories. 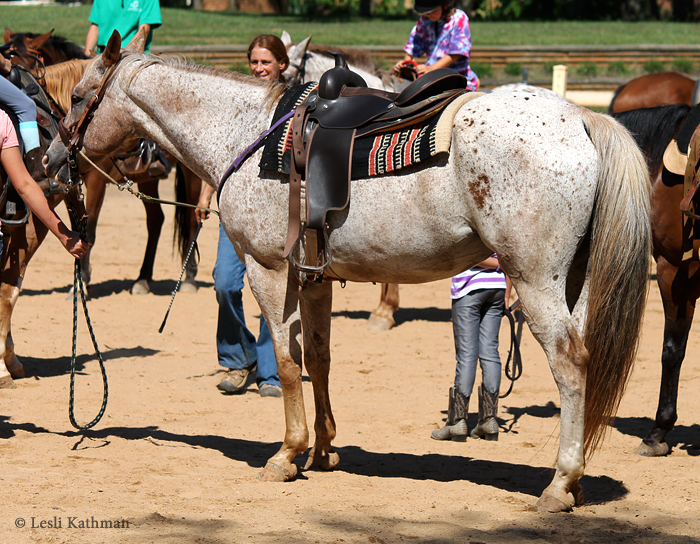 Understanding of appaloosa patterns took a huge leap forward with the work of Sheila Archer and the Appaloosa Project. 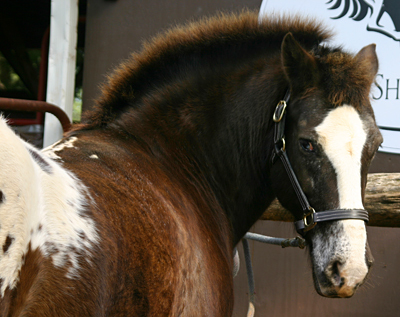 Where older research on horse color (my own included) centered around studying the appearance of individual horses and trends within breeding groups, the Appaloosa Project was able to use modern gene mapping to better analyze information. 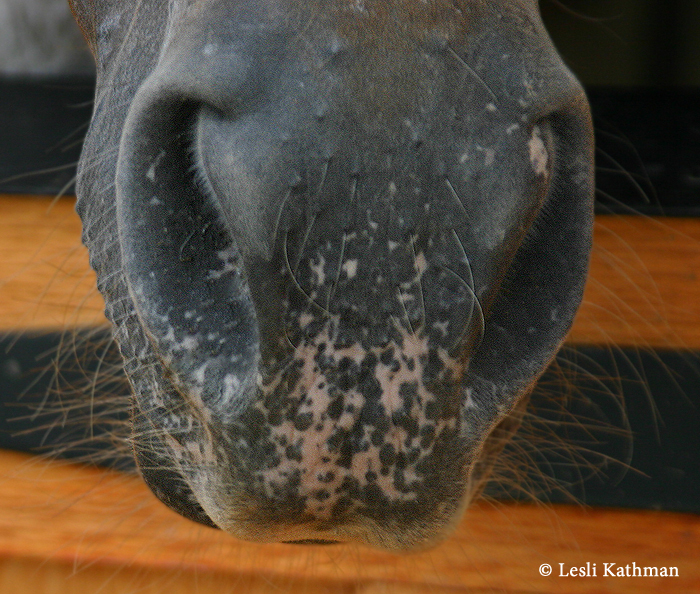 The missing piece – so often overlooked in early studies – was the varnish roan pattern. Far from being a separate, unrelated pattern, the Project researchers found that varnish was the key to all the other patterns. Color genes are often likened to on/off switches. What was discovered with the appaloosa patterns was that there was a “master switch”. This switch, when in the “on” position, made the whole range of patterns possible. If that switch was off (i.e., if that gene was not present), then none of the patterns were possible. The gene itself did not create the patterns. Or rather, it created one of them; the one that had been ignored for so many years. 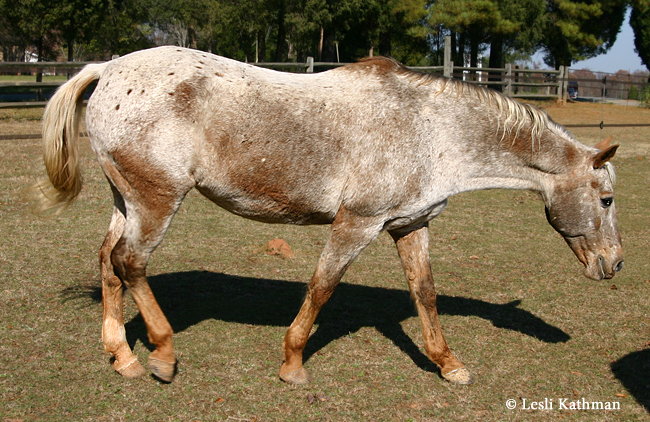 The “master switch” for all the appaloosa patterns is the gene responsible for varnish roan. Underneath whatever other patterns are present, all appaloosas are varnish roans. This gene has been named “leopard complex”, which is usually abbreviated Lp. The name has lead to some confusion, since the gene is not directly reponsible for the leopard pattern. Instead, it sets the stage for the group (the “complex”) of patterns that includes – and is best known for – leopard. So What Does the Leopard Complex Gene Do? 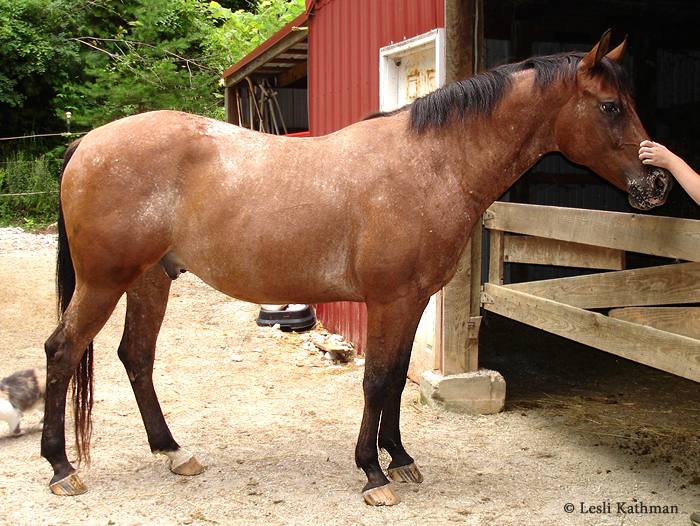 hindquarters, excepting some small spots on the hips, which are usually more densely pigmented than the body. The darkest areas (aside from the spots) appear along the high points of the body – the points of the hip and elbow, the outer edge of the barrel, the nasal bones, the ears – and the legs. The guy at the top of this post is a really good example to show where the varnish marks occur. His face is still dark now, but the beginnings of the classic “V” shape on the nasal bones can be seen in his face shot. 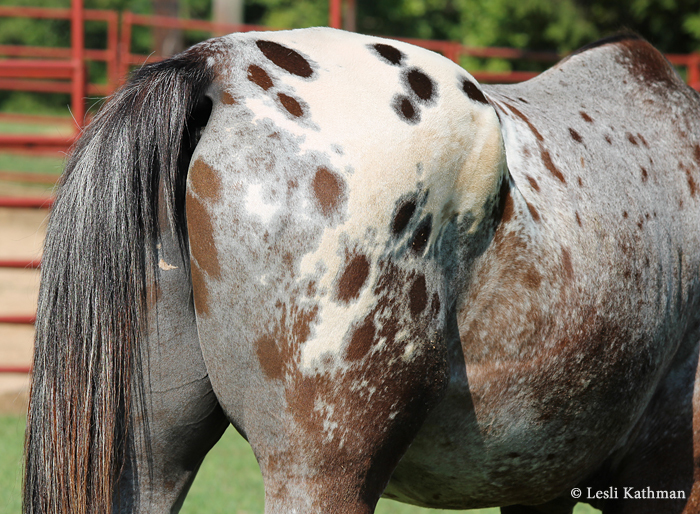 The leopard complex gene also creates what horsemen refer to as “appaloosa characteristics”. 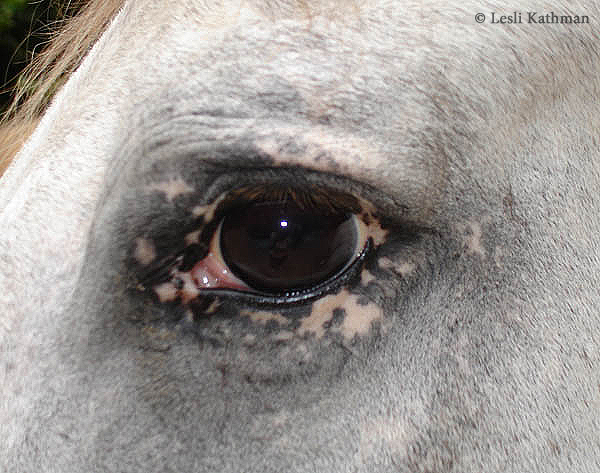 The mottled skin that was featured in the last post is on of those, as are striped hooves and visible sclera. It has often been stated that appaloosas will always have these three things, and that is true, though they are not always obvious – as the mottling pictures show. But they do have some degree of those traits because all appaloosa-patterned horses are (genetically at least) varnish roans. What leopard complex does not do, at least not on its own, is add dense white patterning to the horse, nor does it add dramatic spotting. The louder, highly contrasting patterns so sought after by breeders are the result of other genes that work with the leopard complex gene. Those genes that modify the varnish roan gene, and create the louder appaloosa patterns, will be the subject of the next post.